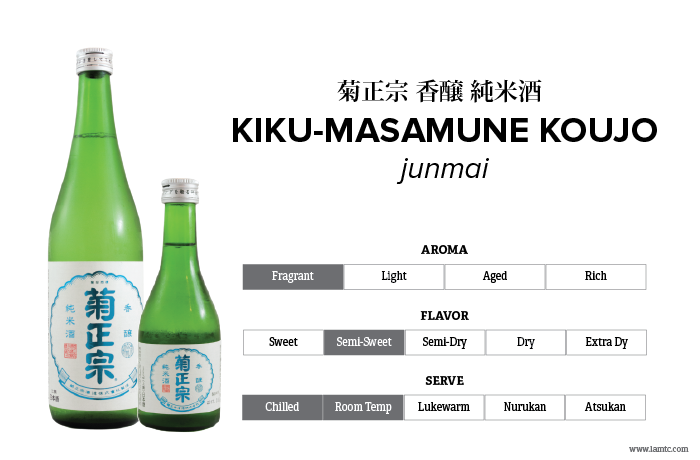 Kiku-Masamune Koujo Junmai is something out of the ordinary in contrast to other typical junmai Sake from Kiku-Masamune brewery. Koujo Junmai is brewed using the brewer's newly invented original yeast, Kikumasa HA14. This new yeast brings out the fruity Ginjo characteristics without milling the rice to Ginjo standards. Nose of crisp apple and its delicate sweetness is uniquely balanced with the original umami of Junmai. Brewery: Kiku-Masamune Sake Brewing Co., Ltd.